Operation Christmas Child is an international nonprofit that collects shoe boxes filled with school supplies, hygiene items and toys and distributes the boxes to children all around the world. Operation Christmas Child is a project of Samaritan’s Purse, headed by Franklin Graham. Operation Christmas Child has been great at utilizing social media to carry its cause to millions of followers across the United States and the world. One example we will look at today is Pinterest. As the third most popular social media site, Pinterest is gaining momentum and nonprofits are learning the value of engaging with visual content. Repin: In addition to pinning original content, Operation Christmas Child created boards of inspirational scripture verses that relate to its target audience. By “repinning” user’s pins of scripture and inspirational quotes, Operation Christmas Child can reach users beyond its followers. Historical Photos: Another great board that Operation Christmas Child uses displays photos from the past that show progress toward the 100 millionth shoebox. This is a great visual timeline and provides an interactive history display highlighting specific years and accomplishments. Link to Partners: Since Pinterest is a traffic-driver, Operation Christmas Child also has boards dedicated to its partner organizations and media coverage. Building brand awareness and driving users to blogs, newspaper articles and videos about Operation Christmas Child’s events and special interest stories helps share the mission and vision and provides credibility through garnered media coverage. Pins about and from partner organizations help strengthen the relationship and provides an outlet to explain the partnerships to its audience. Hashtag: Similar to twitter, the search function on Pinterest includes using hashtags. 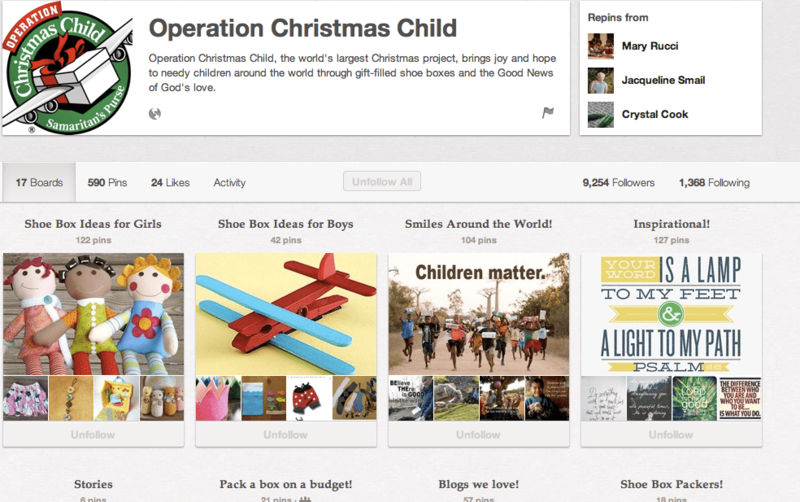 During National Collection Week, Operation Christmas Child pinned photos of users packing shoe box gifts and encouraged users to share their photos using #NCW2012.